Grouse Complete Body Skin with wings & tail. Grouse, a classic fly tying material used in the traditional patterns. This body skin is great for winging material, nymph legs and wet fly soft hackle among many other uses - a super investment. Grouse Whole Wings, brown and tan mottled feathers make them a very good, traditional fly tying material. Grouse Whole Wings - Pair from Veniard. 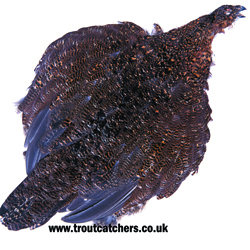 Grouse Speckled centre tails, an absolute essential material when tying your Grouse and (various colours) fishing fly. 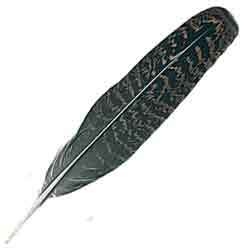 Veniard Grouse Speckled Centre tail comes in packs of 6 feathers, each feather approx 12cm in length. 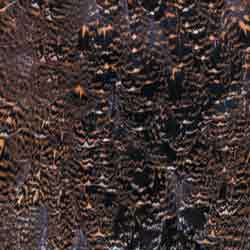 Grouse body plumage, brown and black mottled feathers used for hackles, legs and wing cases. Grouse plumage a traditional fly material for wet flies, spiders, nymphs and caddis flies etc. 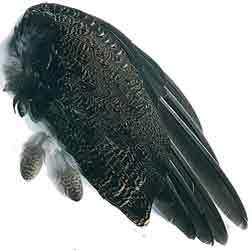 Grouse Body plumage from Veniard 2gram pack.